What could easily been a teen superhero disaster is actually a pretty good fist at an origin tale for Professor X and Magneto. 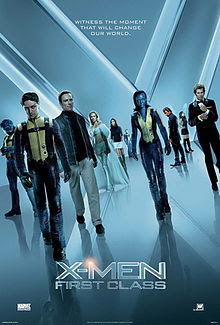 It's a movie caught by it's own tail at times: we need to know why the young mutants choose between X or Magneto but too much of the teens and it becomes 90210 with mind control. As a result we don't really see enough of any of them to know why they choose one way or another and therefore care little. Despite an accent that seems to dive all over Europe Michael Fassbender is fantastic as Magneto, all the best scenes are his. At the start of the movie he's chasing down his Nazi tormentor (and killer of his mother in a concentration camp) played by Kevin Bacon. It's almost Bond like at times and there's a great scene in a Swiss bank where Erik extracts a filling, the camera sitting inside the 'victims' mouth as he uses his magnetic gifts to pull the metal free. Ouch. James McAvoy brings a playfulness to Professor X in his pre wheel chair bound days at college in England. There's a nod to him using his mind control in slightly strange ways but mostly he's a young idealist, the opposite of the vengeful Erik. The two are thrown together by the Cuban Missile crisis. Yep, it's ridiculous, as is Magnetos telepathy blocking hat by the way, but the story just about hangs together. They seek out other mutants to help them overcome Bacon, who it transpires is a mutant trying to bring about humanities destruction via nuclear war. It's all pretty convoluted but despite a rather dull middle, the climax is enjoyable enough. As with the previous X-Men films, too many mutants and you start to lose track of who's who. Characters get little screen time but play an integral part in events and you can't help but feel that the other Marvel franchise is going about things in a far more sensible way. Introduce the key players in their own movies before unleashing all of them at once. Boom! etc. Of the other mutants only Beast and Mystique get much screen time with the former getting an interesting journey. Not necessarliy one the fans will love but it works inside the movie.